Rabbits are prone to gastrointestinal tract diseases. One commonly observed gastrointestinal tract disease in rabbits is enteritis, or the inflammation of the intestines. Enteritis can cause high death rates in rabbits. A variety of causes can lead to enteritis, and if left untreated, it can result in serious health consequences for the rabbit. Enterotoxemia is one form of enteritis caused by pathogenic bacteria overgrowth. Mucoid enteritis, another form of enteritis, can cause a high level of mucus secretions, which can build up in the intestines of the rabbit. Factors that can alter the bacterial population in the cecum of rabbits can result in enteritis. The most common cause of enteritis in rabbits is an inappropriate diet. Frequently, diets low in fiber and high in simple carbohydrates lead to enteritis, as they are not ideal for the rabbit’s gastrointestinal tract. The simple carbohydrates are rapidly broken down by the bacteria in the cecum, causing a rapid overgrowth of bacteria, particularly the pathogenic strains. Additionally, sudden changes in diet or extreme fiber levels (too low or too high) can lead to the disease. Stress and environmental factors also can cause enteritis. Stress can be caused by changes in the environment, travel, movement to a new home, excess heat, and other factors. Long-term or inappropriate antibiotic use can lead to an increased risk of enteritis by altering the appropriate balance of bacterial populations in the cecum. If enteritis is not detected early, treatment may not be effective. Because rabbits mask signs of illness to avoid attracting the attention of predators, rabbit owners may not be aware of the fact that their rabbits have enteritis until it is too late. Treatment includes providing fluids and attempting to get the mucus to pass through the gastrointestinal tract. Veterinarians may provide a product such as Oxbow Animal Health's Critical Care that can be syringe-fed and contains fiber. This treatment may help move the mucus and any intestinal blockage through the gastrointestinal tract and begin to promote growth of a healthy bacterial population in the colon. 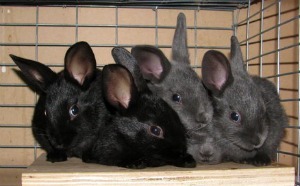 The best way to protect your rabbit from enteritis is prevention. Provide your rabbit with a high-quality, high-fiber diet. Choose the diet appropriate for the life stage of your rabbit to ensure adequate fiber intake, and avoid high simple-carbohydrate foods such as excess corn. Allow your rabbit free access to high-quality hay sources. In addition, decreasing potential stressors helps prevent the disease. Provide your rabbit with a consistent environment. Handle and groom your rabbit regularly, and observe it for changes in appetite and stool production. Consult your veterinarian if you notice any changes in your animal’s normal routine.